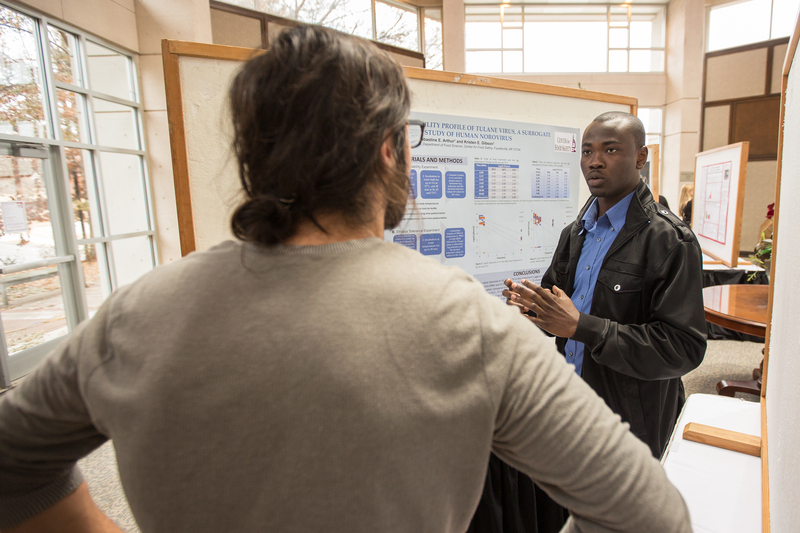 Sabastine Arthur, a master's student in cell and molecular biology, explains his research prior to Tuesday's ceremony honoring winners in the University of Arkansas' annual graduate student poster competition. Arthur finished first in the food science category. Photo by Matt Reynolds, University of Arkansas. FAYETTEVILLE, Ark. – The University of Arkansas presented awards to 28 first- and second-place winners in the university’s graduate research competition during a ceremony on Tuesday, Dec. 2, at the Janelle Y. Hembree Alumni House. The award winners' posters were displayed in Sturgis Hall and the awards were presented by Gearhart and Sharon Gaber, provost and vice chancellor for academic affairs, in Boyer Hall. Kim Needy, dean of the Graduate School and International education, served as the master of ceremonies. Nearly 140 graduate students from all academic areas on campus competed in the seventh-annual contest, “From Abstract to Contract: Graduate Student Research Poster Competition.” The public viewing and judging portion of the competition was held Nov. 15 in Mullins Library. The winners received $200; those placing second got $100. Sabastine Arthur, a master’s student in cell and molecular biology; his adviser is Kristen Gibson. John Blanchar, a doctoral student in experimental psychology; his adviser is Scott Eidelman. Joseph Carmack, a doctoral student in mechanical engineering; his adviser is Paul Millett. Mark Janowiecki, a master’s student in entomology; his adviser is Allen Szalanksi. Matthew Jennings, a doctoral student in biology; his adviser is Daniel Lessner. John Malmo, a doctoral student in recreation and sport management; his adviser is Merry Moiseichik. Furkan Oztanriseven, a doctoral student in industrial engineering; his adviser is Heather Nachtmann. Payam Parsa, a doctoral student in industrial engineering; his adviser is Manuel Rossetti. Kalavathy Rajan, a doctoral student in food science; her adviser is Danielle Julie Carrier. James Turner, a doctoral student in chemical engineering; his adviser is Shannon Servoss. Alexander O. Villarraga, a doctoral student in public policy; his adviser is Brinck Kerr. Amie West, a doctoral student in environmental dynamics; her adviser is Thad Scott. Anindya Ambuj, a doctoral student in physics, his adviser is Surendra Singh. Cayla Greer, a master of fine arts student in theatre; her adviser is Patricia Martin. Simone Peinkofer, a doctoral student in supply chain management; her adviser is Terry Esper. Robert Pellegrino, a master’s student in food science; his adviser is Philip Crandall. Richard Perry, a doctoral student in kinesiology; his adviser is Tyrone Washington. Sruthi Ravindranathan, a doctoral student in biomedical engineering; her adviser is David Zaharoff. David Rolfe, a doctoral student in recreation and sport management; his adviser is Merry Moiseichik. Reiofeli Salas, a doctoral student in crop, soil and environmental sciences; her adviser is Nilda Burgos. Priyanka Sharma, a doctoral student in cell and molecular biology; her adviser is Ralph Henry. Rebecca Smith, a master’s student in communication disorders; her adviser is Lisa Bowers. Fan Wang, a doctoral student in industrial engineering; his adviser is Shengfan Zhang. Meng Xu, a doctoral student in biological engineering; his adviser is Yanbin Li.